Go to Edit This Campaign > Tool Settings > Registration Manage > Registration Groups - Published > Edit for the registration group to which you'd like to add a new price. Scroll down to "Registration Types" and click on Add New Registration Type button or choose to clone your existing registration type details and settings using the Clone This Registration Type Button. This will create a new registration type. Click Publish Registration Group to save changes. 3. Market Value - The amount of the price which is not tax deductible. The value can be anywhere from 0 to the same amount as the price chosen, but can't be more than the price. Keep in mind that tax deductible amount = price - value. For example, if the full $30 price is tax-deductible, I would list "0" for the value. If the $30 price is not tax-deductible, I would list "30" for the value (even if the market value of what the supporter will receive may be more than $30). If I list $30 for price and $5 for market value, then the receipt will list $25 as tax-deductible. 4. Registration Type Description - An optional description for this type. Adding a description will list a small description under the Title on the campaign. 5. Quantity Available - Unless there is a physical cap to how many can be sold, keep this as Unlimited. If you'd like to cap out the sales, toggle to Set # and enter the quantity available. Registrations will be listed as "sold out" and won't be available for purchase if this quantity is reached. 6. Amount Limits Per Order - How many of these someone can select in a single transaction. The min and max can each be anywhere from 1 to 30. These will be shown as a dropdown when they choose the quantity to purchase. 7. Quantity Display Options - You can either show how many of this type have been reserved, how many are still available, or neither. If choosing to show quantity, it will be displayed as a small number next to this registration option, such as "8 sold" or "4 available" or "Sold Out"
8. Set date and time constrains for registration? - If toggled to No this registration type will be available until the end of your event (as indicated in the Registration Group time). 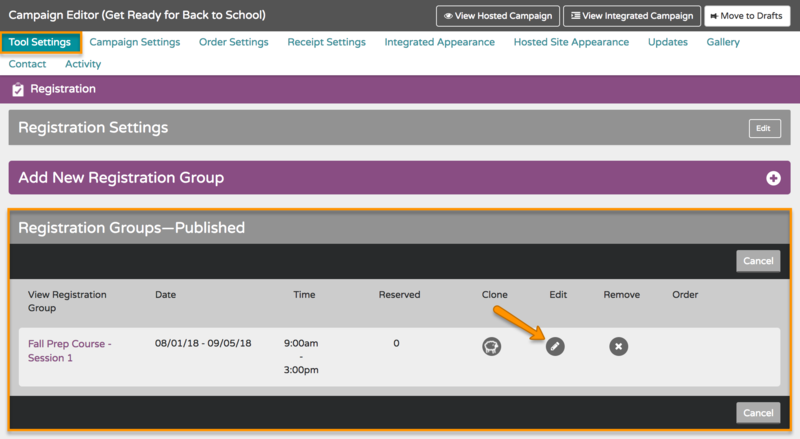 If you'd like this option to not be available to the public until a certain date and time, or if you'd like it to automatically expire and disappear on a specific date and time before the one listed on the registration group, you can toggle this to Yes and indicate the start and end time. Tip: to change the year, click on the year until it displays a list of years to choose from. 9. 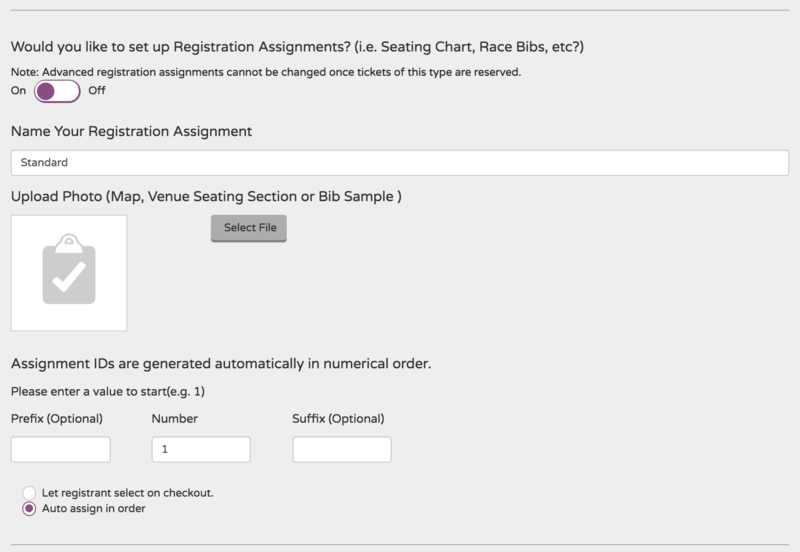 Advanced Registration Assignments - Toggle to On if you'd like to use seating assignments, bib assignments, etc. at the time of registration. You can have them automatically assigned in order of purchase, or have the registrant choose their assignment. You can add a seating chart or other related image and set up the numbering structure, including starting number, and optional prefix and/or suffix. 10. 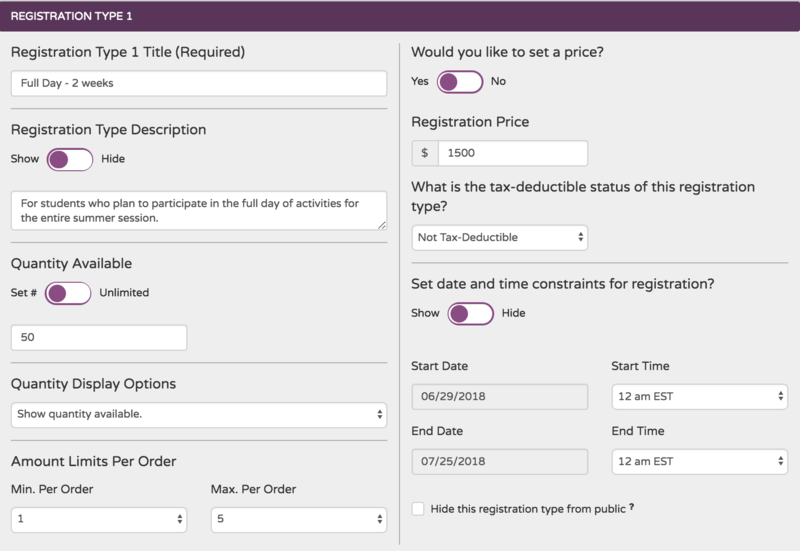 Advanced Registration Type Settings - Here you can setup Sales Tax Collection, Shipping, and Custom Fields and Waivers for each individual registration type in your campaign.